Airline credit cards are a great way to earn rewards that you can use toward free flights, hotels, and other travel perks. Airline credit cards pay a higher amount of rewards when you use your credit card to purchase flights directly from the associated airline. All the airline credit cards on our list pay out great bonus miles if you meet the minimum required spending in the first three months of having your account. When you’re choosing an airline credit card, consider how frequently you fly on that airline since that’s the best way to earn a higher number of rewards. Want some help to see how all the benefits shake out? Keep reading to find the best one for you. 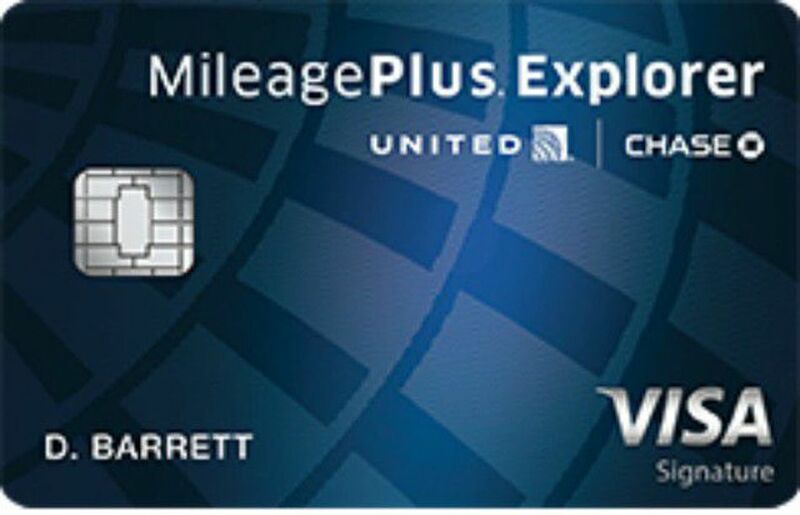 The Chase United MilesPlus Explorer Card pays 40,000 bonus miles if you spend $2,000 on purchases in the first three months from account opening. You can also earn an additional 25,000 miles after spending $10,000 in the first six months. The card pays two miles per dollar on all items purchased from United, including tickets, Economy Plus®, inflight food, beverages and Wi-Fi, baggage service charges and other United fees; two miles for each dollar spent at restaurants and on hotel accommodations when purchased directly with the hotel; and one mile per dollar on everything else. There’s no limit to the number of miles you’ll earn and your miles don’t expire as long as your account is open. Your MileagePlus miles can be used toward travel United, starting as low as 12,500 miles. Receive credit up to $100 every four years as reimbursement for the application fee for Global Entry or TSA Precheck® (when charged to your card). And receive 25 percent back on United in-flight purchases. Other credit card perks include priority boarding and no fee for your first checked bag for you and a companion. Important Pricing: APR is 17.99 to 24.99 percent depending on your credit rating. The $95 annual fee is waived in the first year, and there’s no foreign transaction fee. With the JetBlue Plus Card, you’ll earn 40,000 bonus points after you spend $1,000 on purchases in the first 90 days. Plus get 10 percent of your points back every time you redeem your miles. And, you’ll receive a $100 statement credit after you purchase a Vacations package with your card. Each year on your account anniversary, you’ll receive 5,000 bonus miles. Earn six points per dollar on all JetBlue purchases; two points per dollar at restaurants and grocery stores; and one point per dollar on all other purchases. Redeem your points for any seat on JetBlue-operated flights, and enjoy your first checked bag for free. There are no blackout dates on Jet Blue-operated flights, and points don't expire. Important Pricing: There’s a 0 percent introductory APR on balance transfers for the first 12 billing cycles. Balances must be transferred in the first 45 days to be eligible for special pricing. The regular APR is 17.99, 21.99, or 26.99 percent depending on your creditworthiness. There’s a $99 annual fee and no foreign transaction fee. Citi AAdvantage Platinum Select World Elite MasterCard pays 60,000 bonus miles after you make $3,000 in purchases in the first three months of opening your account. To be eligible for the bonus miles, you must not have had any consumer Citi AAdvantage card opened or closed in the past 24 months. Ongoing, you’ll earn two AAdvantage miles for every dollar spent on American Airlines purchases and one AAdvantage mile for every dollar spent on other purchases. Earn a $125 American Airlines Flight Discount after you spend $20,000 or more in purchases during your card membership year and renew your card. When you use your miles to fly on American Airlines operated flights, you’ll save on miles. Earn two miles for every dollar spent at restaurants; plus, earn two miles for every dollar spent at gas stations. With the Citi AAdvantage Platinum Select World Elite MasterCard, you’ll have the privilege of priority boarding and your first checked bag is free. Use your credit card for in-flight food and beverage purchases and receive a 25 percent savings on your purchase. Important Pricing: APR is 18.24 to 26.24 percent based on your creditworthiness. There’s a $99 annual fee that’s waived in the first year and no foreign transaction fee. The Delta Reserve Credit Card from American Express is one of the few credit cards that pays rewards to help you earn elite status. With the card, you’ll earn 10,000 Medallion Qualification Miles (MQM) and 40,000 bonus miles after you spend $3,000 on purchases in the first three months of opening your account. Plus, you can earn 15,000 MQM and 15,000 bonus miles after you spend $30,000 on eligible purchases on your credit card in a calendar year. Spend $60,000 on eligible purchases in a calendar year and you’ll earn an additional 15,000 MQM and 15,000 bonus miles. Medallion Qualification Miles help you obtain Medallion Status, giving you access to perks such as unlimited complimentary upgrades and the ability to earn more miles at each tier. Ongoing, you’ll earn two miles per dollar on Delta purchases and one mile per dollar on everything else. You can redeem miles toward travel on Delta and over 15 airline partners. Important Pricing: The regular APR is 17.99 to 26.99 percent based on your creditworthiness. The annual fee is $450, and there’s no foreign transaction fee. Earn 50,000 bonus miles after you make $1,000 in purchases on your new Delta SkyMiles Credit Card within the first 3 months. You’ll also receive a $50 statement credit after you make a Delta purchase with your card in the first three months. Ongoing, you’ll earn two miles per dollar on Delta purchases and one mile for every dollar you spend on purchases. Plus enjoy priority boarding and check your first bag for free. Important Pricing: The regular APR is 17.99 to 26.99 percent based on your creditworthiness. The $95 annual fee is waived in the first year and there’s no foreign transaction fee. The Chase Southwest Rapid Rewards Premier Card pays 40,000 bonus points after you spend $1,000 on purchases in the first three months of your account opening. You can earn an additional 20,000 points when you spend 12,000 in the first 12 months. Earn two points per dollar spent on Southwest Airlines flights and purchases from Southwest hotel and car rental partners; and earn one point per dollar spent on all other purchases. The card pays 6,000 anniversary points each year on your cardmember anniversary. You can redeem points for international flights, cruises, hotel stays, car rentals, and gift cards. Important Pricing: There’s a $99 annual fee. No foreign transaction fees. You’ll get 30,000 bonus miles after spending $1,000 or more in purchases in the first 90 days of opening your account. Plus, for a limited time, you can buy one ticket and get one after you make $1,000 or more in purchase in the first 90 days of opening your account. You’ll only be responsible for the taxes and fees on the free ticket. Get a Companion Fare ticket every year on your account anniversary for Alaska and Virgin America flights that you book on alaskaair.com. Earn three miles for every dollar you spend on Alaska and Virgin America purchases and one mile per dollar on everything else. Important Pricing: The regular APR is 16.99 to 24.99 percent, based on your creditworthiness. There’s a $75 annual fee for Visa Signature accounts and $50 for Platinum Plus Visa accounts. The type of account you’re approved for is decided at the time of your application based on your credit qualifications. With the British Airways Visa Signature Card, accountholders can earn 50,000 bonus points after spending $3,000 on purchases in the first three months after opening their account. Then, you can earn an additional 25,000 bonus points after spending $10,000 on purchases in your first year, and another 25,000 bonus points after you spend $20,000 total on purchases in the first year. Altogether, that gives you an opportunity to earn 100,000 bonus points your first year of owning a British Airways Visa Signature Card. Just note that you’re only eligible for the bonus if you’re a new cardholder and you haven’t earned a signup bonus from this card within the past 24 months. Ongoing, you’ll earn three points — which are referred to as Avios — for every dollar you spend on British Airways flights and one bonus point for all other purchases. New card members are automatically enrolled in the Executive Club which qualifies you for a Travel Together Ticket if you make $30,000 in purchases in a calendar year. Important Pricing: The $95 annual fee is waived in the first year. The regular APR is 17.99 to 24.99 percent. There’s no foreign transaction fee. Sign up for a Frontier Airlines World Mastercard — and pay the $79 annual fee — and you can earn 40,000 bonus miles after spending $500 on purchases within the first 90 days. You’ll earn five miles for every dollar you spend on purchases at FlyFrontier.com; three miles per dollar spent on restaurant purchases; and one mile per dollar on all other purchases. Plus, every dollar you spend allows you to earn one Qualifying Mile toward Elite Status and a $100 flight voucher each year on your account anniversary when you spend $2,500 or more annually. You’ll have 180 days to use your flight voucher before it expires. In order to maintain your rewards, you have to make at least one purchase every six months, otherwise, your miles will expire. Receive an award redemption fee waiver whenever you use your Frontier Airlines World Mastercard to pay the taxes and fees on your award tickets. Important Pricing: Enjoy zero percent introductory APR on balance transfers made in the first 45 days of account opening. The regular APR is 17.99 to 26.99 percent. There’s no foreign transaction fee.